Engraved with fire and ice. How is that possible? Enjoy your wins on Fire Vs Ice. With loads of bonus rounds, Wild symbols and free spins just for you! 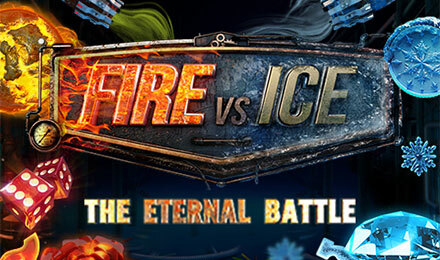 Fire Vs Ice is a Pariplay slot game that consists of 5 reels and 25 paylines. Enjoy the exclusive slot game that is overflowing with fiery free spins and icy bonus features. Let the background put you in a different setting while you enjoy the war between fire and ice. With an RTP of 94%, enjoy the different symbols like flaming dices, burning roses, frozen bars, diamonds, snowflakes, flaming free games symbols and the low cards. Let the wins make you sweat while you tremble with amusement at the unique slot game.